Your support today will help us work for a healthy Middle Fork watershed. Your donation will help kids access quality outdoor education through our Rangers and Stewards programs, protect valuable habitat through our restoration projects, and share the joy of our watershed through Discover Your Watershed events. Keep reading to find out how you can help. Individual donors are the heart of our organization, funding local restoration projects, landowner education, monthly events and tours, stewardship opportunities and watershed science-based school programming. We are happy to accept one-time or reoccurring donations through our secure online donation form. Personal checks can also be made out to Middle Fork Willamette Watershed Council. Donations can be made in someone else’s name to honor holidays, anniversaries or achievements – we will gladly send a special acknowledgement of your gift with a Beautiful Oregon card! 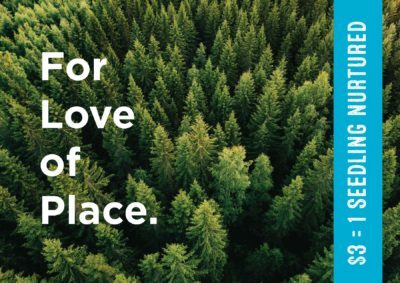 Give the gift that keeps on living and help steward trees in the Middle Fork Willamette watershed. A gift of just $15 helps to care for 5 seedlings so they survive and thrive in the first five years. Your donation will go into a stewardship fund managed responsibly by us that will be used to nurture native trees and shrubs that have been planted for the benefit of people and wildlife. 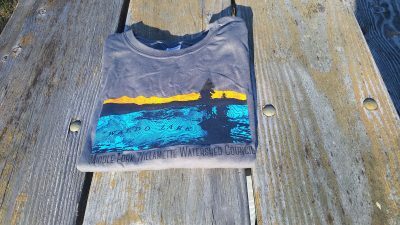 Our Waldo Lake T-Shirt not only celebrates one of our watersheds iconic landmarks, but it also supports the work we are doing to protect it. All proceeds from these shirts go directly to support our work for a healthy Middle Fork Willamette Watershed. Thanks to Amazon Smile 0.05% of all your purchases can go directly to the causes you care about the most. Select the Middle Fork Willamette Watershed Council and always start shopping at smile.amazon.com to help support our mission. Click the icon above to get started! The Middle Fork Willamette Watershed Council is now part of Fred Meyer Community Rewards! You can donate to MFWWC simply by shopping at Fred Meyers, and you earn the same rewards points that you always have. Simply click on the icon above and use our unique nonprofit code 89292 to register your card. We are lucky to live in a place where our businesses are so connected to the community. We would love to work with you to help support our communities through environmental education and habitat restoration. Our business support program is comprised of three tiers: the lower, middle, and upper forks. To learn more about our program check out this info sheet or contact gale@middleforkwillamette.org. Together we can work towards a healthy Middle Fork Willamette Watershed. A bequest is a gift from your estate—a transfer of cash, securities, or other property made through your estate plans. A bequest can be made for a specific amount, for a percentage of your estate, or for all or a portion of what is left after you have made bequests to your family. You can also name the Middle Fork Willamette Watershed Council as a beneficiary of a retirement plan or life insurance policy, and designate your gift to a specific purpose or project. Planned contributions help to sustain and strengthen the future conservation and restoration in the Middle Fork Willamette watershed, keeping your legacy within our local communities. To learn more about how to work with us to develop a planned gift, please contact our Executive Director, Sarah Dyrdahl at sarah@middleforkwillamette.org.